The VILLA Adriatic is situated in the upper part of the place Mlini (7 Km from Dubrovnik center). Thanks to this location guests can enjoy a beautiful view towards the Adriatic. From the accommodation different types of beaches (sand & small pebbles) can be reached by walk in 5-10 minutes. Shops, post & bank offices (ATM's), cafés and restaurants can be found in 2-10 minutes of walk from the property. The bus-stop for the local bus-lines to Cavtat or Dubrovnik is a 2 minutes walk only. At the guest's disposal is also a secure parking which is big enough for buses too. Available are fourteen rooms with double bed, en-suite shower/WC and air-conditioning and two studio apartments with double bed, two separate beds, en-suite shower/WC and terrace with sea view. Ten of the rooms offer sea-view and also have a balcony. 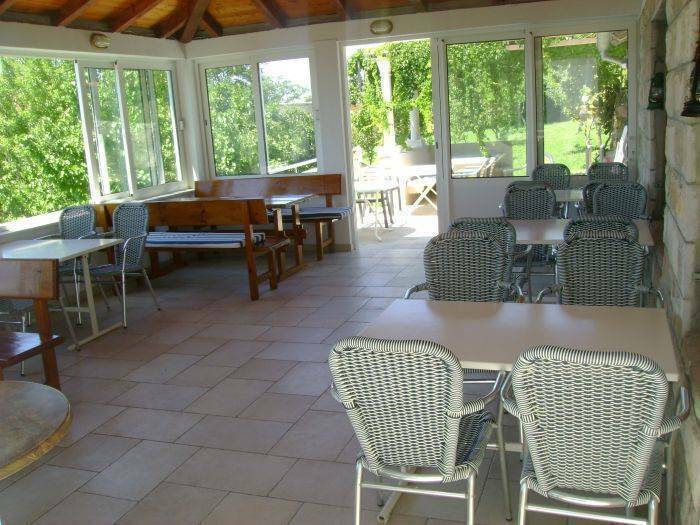 On the shady and silent terrace each room has its own table and chairs. There is also one common kitchen with several fridges, and outside barbecue and a garden. During your stay you should also visit the Church of St. Hilarius (1449) and the Chapel of St. Roch which are both in the vicinity of the beach. Remains of Roman buildings can be found on the way to Cavtat. Mlini is part of the touristic resort of Zupa. Sandy beaches, cafés, restaurants and many other touristic offers are avail-able. Ideal is the vicinity to Dubrovnik and Cavtat (the local buses pass every 30 minutes). In Mlini you can have both, a restful holiday in a silent Mediterranean place and entertainment in touristic centres. The VILLA Adriatic is the ideal accommodation! Mlini is a small fishing village on the northern coast of the Bay of Zupa, only 7 km east of Dubrovnik. In former times the place was known for its water mills ('Mlini' means 'Mills') because many brooks and streams enabled their use. The brooks with many small falls still pass through the place and are today inhabited by innumerable ducks. These streams, rich Mediterranean vegetation and typical Dalmatian buildings make Mlini to a wonderful, picturesque place. Discover it! Guests can pay during the stay to the host in cash. The currency can be arranged with the host upon arrival. In case of no show or late cancellation (up to 20 days) the whole amount will be charged on the credit card. From Dubrovnik drive in direction of Dubrovnik Airport. After you have entered Mlini (bill-board on the road), go on driving for about 2 minutes. You will then see on the left side of the road an impressive, large oak (tree), a bus stop and a grocery shop ('TRGOVISTE'). Please stop there and call your host. He will then come to meet you. From Dubrovnik Airport drive in direction Dubrovnik, after you have entered Mlini (bill-board on the road), go on driving until the next bus station 'TRGOVISTE' on the right side. Please stop there and call your host. He will then come to meet you. We can arrange a tranfer from the airport, bus station or other places to the VILLA Adriatic.